Let’s face it, finding a new career path is scary. With all due respect to Count Dracula, Mr. Wolfman and the other spooky creatures out there, the job search packs in more frightening moments than all of them combined. Thankfully, just like these ghouls from childhood memory, the fear we’ve built up around looking for a new job is nothing more than a product of our imagination. That’s why we’re dedicating this week to facing that fear, job seekers, by giving you the tricks (and treats) you’ll need to be successful. Making the choice to move forward takes courage – whether you’re currently working in a comfortable position, looking to leave a toxic environment or coming off of a recent gap in employment. While it is always a good idea to spend time reviewing the pros and cons to determine if a move is right for you, it’s important not to be caught in trap of choice paralysis, or being so overwhelmed that you simply do nothing. Rather than focusing on all of the unknown factors surrounding this decision (many of which you cannot control,) take this time to determine what’s most important to you. If it feels right, do it. It may have been a while since you’ve taken the time to outline your specific career goals. It’s one thing to know you need a change, it’s another to have a clearly defined destination in mind. If one overall goal proves too daunting for you, try coming up with some smaller, more obtainable goals for this period of change. For example, setting the goal, “Find my dream job,” may seem terrifyingly tough, but defining smaller goals along the way, such as, “Learn a new industry skill,” or “Work on a smaller team” can help guide you through these fears. Even if you’ve determined that, deep down, this move is the right choice for your professional fulfilment, another set of fears that can freeze your search have to do with those around us. Thoughts like, “What will my friends think of me?”, “How will I explain this transition to my family?” and “I don’t want to be seen as a burden.” aren’t uncommon. At the end of the day, the people in your life who make a positive impact will be there to support the choice that is truly best for you. If you need some help, don’t be afraid to communicate your new situation either; support for your search will only come if people know you need it! A resume is like an insurance policy, you file it away and forget about it until you really need it. If the thought of looking at your old resume gives you chills, don’t worry; you are not alone if things like content, grammar and formatting make you just a little bit nervous. Thankfully, there are tons of resources available for job seekers in need of rewrite. Ask friends in your network to review your edits, check out helpful blog articles for tips (like this one! ), and there are even professional resume services out there to help get you on back on track. The greatest fear of all comes from within – the fear that you’re not good enough, not prepared enough and not deserving enough to earn a new job. When forced to evaluate your life and career, a sinking feeling may set in as your self-confidence shrinks away. Don’t let this fear cause you to sell yourself short! The job search forces you to look in the mirror and ask some of tough questions. Now’s the time to own your past, stand tall and make the change you need happen. Overcoming your fears can be difficult when starting a new job search; but taking a minute to rethink things might just open your eyes to what’s really there. 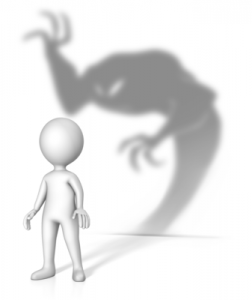 Sometimes the monsters hiding under our beds are nothing more than the shadows playing tricks on us. Do you have any fears from the start of a job search to share? We’d love to talk about them below. And stay tuned all week long as we continue our “Face the Fear” series! This Wednesday, we’ll be taking on creepy, crawly world of interviewing fears. This entry was posted in Job Seekers and tagged face the fear, halloween, horror films, job hunt fears, job search fears, job search tips, job seeker advice, Job Seekers, overcoming fear, scary job search, spooky stories, tips for job seekers. Bookmark the permalink. ← Job Seekers: Here’s How to Conquer Online Job Application Forms!